It sure makes us feel old to say it, but it’s been 22 years since the first year of the HBO Bryant Park Summer Film Festival presented by Bank of America. Today we time-travel back to that first summer. Read on for 90s fashion, nostalgia, and a man in a monkey suit. The first Film Fest poster was colorful, goofy, and unafraid of puns. Is that King Kong fighting a Pterodactyl atop the Empire State Building? Why yes, it is—Jurassic Park came out in the summer of 1993, and the young Film Fest piggybacked on the mania. As you can see, movies have always been on Monday evenings. The 1993 season ran from July through September, unlike our current June to August format. 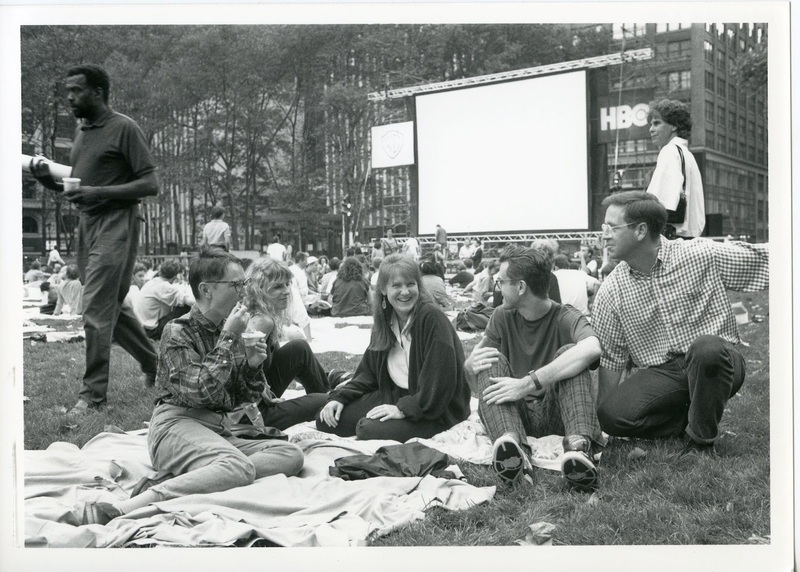 There also used to be 11 films each year, but we shortened it by one week to accommodate a program called Broadway Under The Stars in 2000, and it's been 10 ever since. 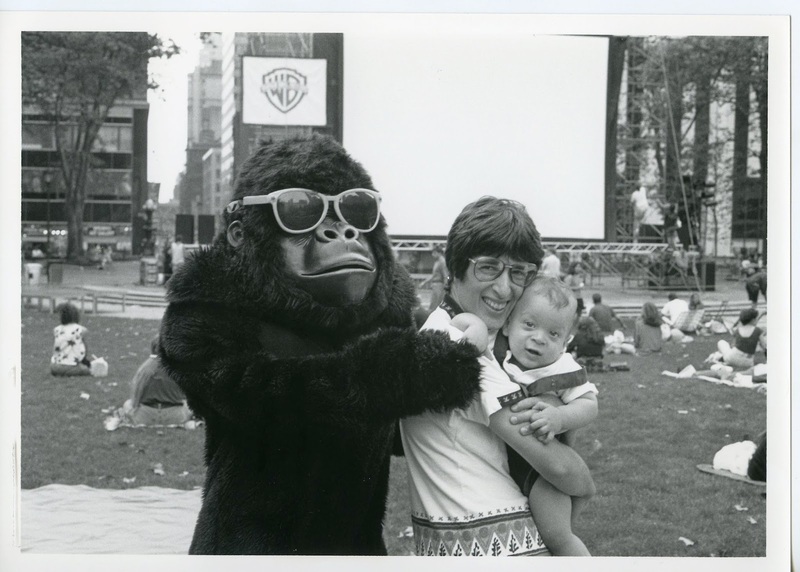 The first year of films drew a much smaller crowd than they do these days, when attendees storm the lawn to get a good spot. 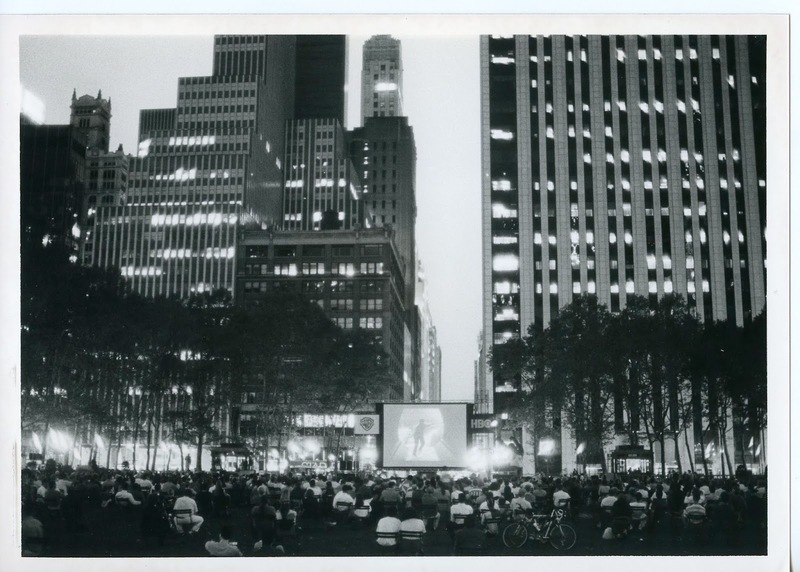 The New York Times estimated 2,000 patrons attended the August 2nd, 1993 screening of Sunset Boulevard—compare that to almost 11,000 at Ghostbusters this June! The Film Fest is proof of one of our governing philosophies of programming: great things can take some time to catch on. Themed costumes: now that’s a tradition we’re glad has stuck around. This furry King Kong impersonator made quite the impression on patrons in 1993. Looking towards the screen, we can see bikes and chairs on the lawn, two things we ask you don’t don't bring onto the lawn during today’s movies. (To see a full list of what is and isn't encouraged, check out our FAQ post.) But the sight of a bunch of strangers clustered together on a summer evening to revel in the movie magic? Some things never change. This week's film is the Poseidon Adventure. We're already planning our costumes. The model for all disaster movies is an epic featuring the biggest stars of the time: Gene Hackman, Leslie Nielsen, Shelley Winters, Ernest Borgnine, Roddy McDowall, and more. A luxury liner is capsized by a rogue wave and with the entire world turned upside down, the survivors must fight for their lives. (1972) 117 min. (PG) Fox.